Photographic Story Being in the room where Dalí created his art work was very inspirational. 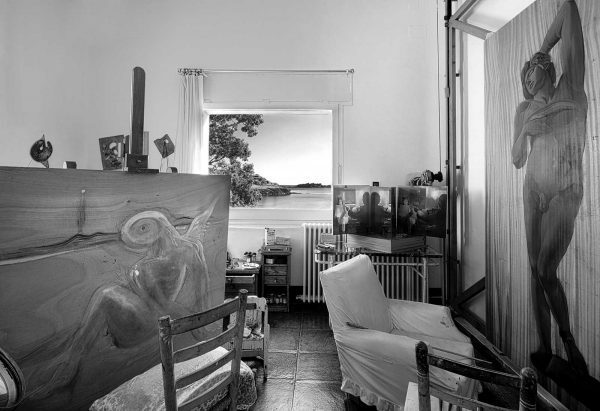 But, I wondered, how did Dalí paint such large canvases in such a small room, and how did he get those giant canvases into this tiny room? Then I noticed the slot in the floor. The canvas was delivered to the basement of his house, then lifted up to his studio through the slot in the floor. As he painted the canvas he dropped it down through the slot. That way he didn’t need to use a ladder to reach various areas to paint. It is a great example of Dalí’s creative thinking. Digital – Archival Pigment Print This photograph was taken with a high-quality digital camera. The photograph is printed on an Epson Stylus 4800 or 11880 printer. Clyde uses archival Ultra-chrome K3 i and prints on archival Harman Hahnemuhle paper. The limited edition photograph is then mounted and matted to current archival standards. This is a limited edition series and each photograph is numbered.